Wire shelf and storage basket in freezer. Top and bottom doors are reversible for left or right opening. Dual crisper with glass lid. Two-liter bottle storage on refrigerator door. Beverage can dispenser holds up to six 12-oz. cans. Modern European design with 9.2 cubic feet capacity. Includes full-range temperature control, removable/adjustable shelving in refrigerator, wire shelf and storage basket in freezer. Top and bottom doors are reversible for left or right opening. 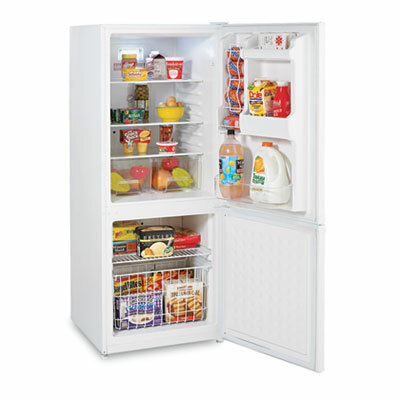 Refrigerator features dual crisper with glass lid and two-liter bottle storage on door. Beverage can dispenser holds up to six 12-oz. cans. Capacity (Volume) 9.200 cu. ft.